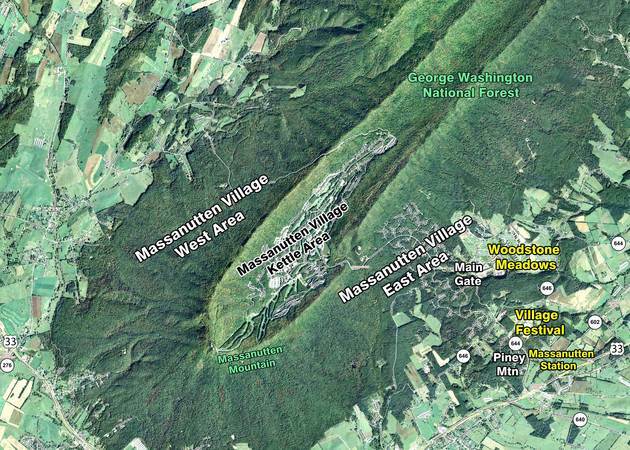 Massanutten is a residential community with resort amenities located in the northwestern part of Virginia, roughly 15 miles east of the city of Harrisonburg. Massanutten is a U.S. Census Designated Place in the County of Rockingham having a population of 2,291 individuals with 2,692 housing units and 676 families, as of 2010. It largely consists of the planned residential districts of Massanutten Village and Woodstone Meadows, plus the planned commercial districts of Village Festival and Massanutten Station. The community has a wide variety of housing to include privately owned dwellings occupied by citizens who permanently live in Massanutten and timeshare dwellings occupied by tourists who transiently enjoy Massanutten’s resort activities. Massanutten Village is the oldest and largest district in the Massanutten community. Development began on the private-gated residential project in 1971. Today, Massanutten Village is a master planned district of 5,066 acres for over 7,000 housing units and an estimated population of over 23,000 individuals. Twenty-five (25) percent of the project has been designated as «open space». To date, only 1,052 private housing units have been built in sixteen (16) residential subdivisions of the Massanutten Village East and Kettle Areas. And, 290 hotel rooms plus 730 timeshare units have been built in separate commercial subdivisions of the Kettle Area, along with businesses and recreational facilities to include ski-slopes, golf courses, and swimming pools. 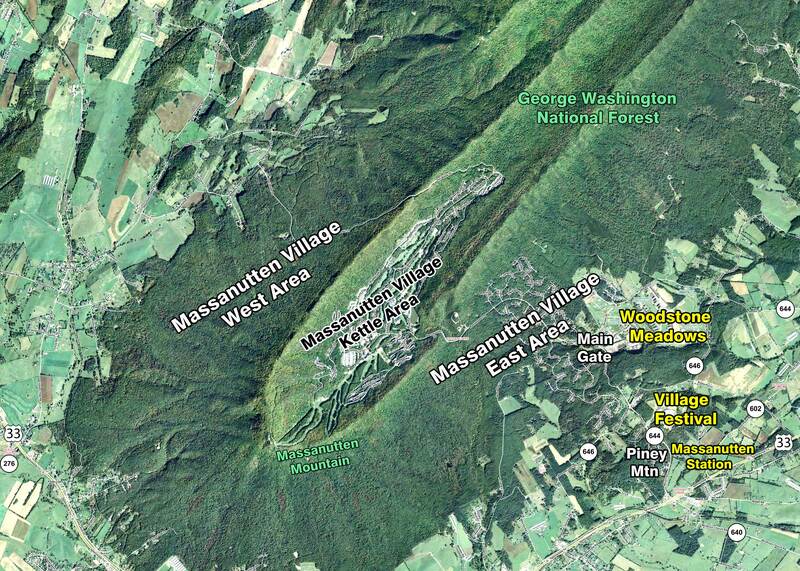 To date, roughly 70% of the project, mostly in the Massanutten Village West Area, remains undeveloped. In 1974, the Massanutten Property Owners Association (MPOA) was incorporated to provide some governance and essential services for the Massanutten Village district. It currently has a budget of almost $2.5 million and employs seventy (70) people, who provide administration, law enforcement, and maintenance services for the district. Overall, Massanutten Village looks and acts much like other towns in Rockingham County having the largest land area, lane miles of roads, housing units, assessed real estate property value, and the largest population, if visitors in timeshare units are included. MPOA has the second largest overall budget and number of employees to include the largest police department. The main differences between Massanutten Village and an incorporated town are that MPOA cannot create or amend Zoning Ordinances, that MPOA essential services are privately funded mostly through property owners’ fees, that MPOA cannot receive any intergovernmental assistance for its essential services, that MPOA cannot levy any taxes on property owners, citizens, businesses, or visitors, and that MPOA’s Board of Directors are not recognized government officials in Virginia. In 1996, the County Supervisors approved plans by Great Eastern Resorts to develop Woodstone Meadows, a planned residential district. Woodstone Meadows was originally approved to be a project of 200 acres featuring 600 timeshare units, a small subdivision of single family dwellings, some businesses, and recreational facilities to include an executive golf course. Before the developer completed even half of the featured timeshares, the County Supervisors approved three amendments to the original plan over a seven year period increasing the size of the project to 435 acres with 1,700 timeshare units. To date, roughly 500 of the 1,700 timeshare units have been built along with the small residential subdivision, a few businesses, and most of the recreational facilities. In 2005, the County Supervisors approved plans by Great Eastern Resorts to develop Village Festival, a planned commercial district. Village Festival was originally approved to be a project of 148 acres featuring an indoor-outdoor Waterpark, a timeshare sales center, hotels, and 150,000 square feet of retail shops. In 2008, the County Supervisors approved an amendment to the southern portion of the project which was subdivided and renamed Massanutten Station. The amendment increased the square footage of retail space to 264,000 square feet and created a district comprised of retail shops, entertainment buildings, recreational areas, and residential housing units. To date, only the first phase of the Waterpark has been built in either of these two districts. The County decision to develop outside the physical and financial boundaries of the Massanutten Village district has had a significant impact on the Massanutten Community. For nearly 25 years, Massanutten Village had comfortably operated with its own privately funded essential services. 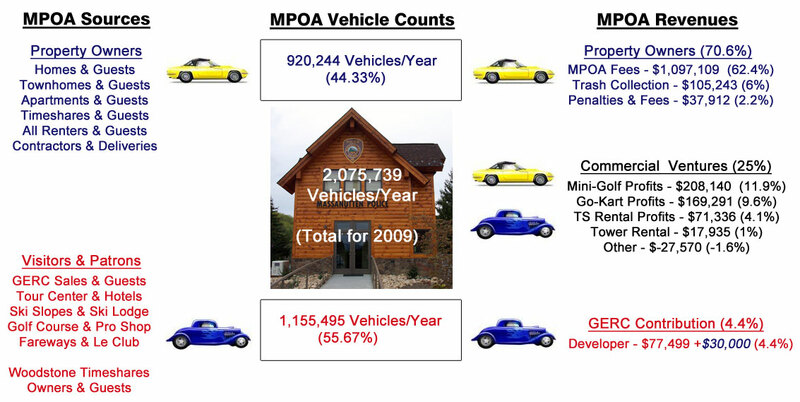 In 1996, 70% of the 1.2 million vehicles entering into Massanutten Village were related to MPOA property owners, whereas only 30% were related to visitors from the general public patronizing Massanutten Village businesses. The financial burden for, and the benefit from, the privately funded essential services was fairly balanced between individual property owners and visitors. Rather than encouraging the developer to complete the Massanutten Village project, the County Supervisors approved the Woodstone Meadows and Village Festival districts which resulted in the financial structure for funding the essential services to be significantly and permanently skewed out of balance, as well as nearly eliminating the concept of the private-gated Massanutten Village district. This is because these districts are outside the financial structure for funding MPOA essential services in Massanutten Village, yet impose a burden on the essential services with a large number of visitors. In 2009, the number of vehicles entering into Massanutten Village was more than 2.075 million, with now more than 55% related to visitors from the general public patronizing Massanutten Village businesses. Yet, more than 70% of the financial burden for the Massanutten Village essential services of law enforcement and road maintenance are borne by the individual property owners of MPOA. The additional daily traffic resulted largely from the visitors occupying timeshare units in Woodstone Meadows traveling to recreational facilities and businesses in Massanutten Village. The number of vehicles entering into Massanutten Village has doubled since the approval of the Woodstone Meadows development in 1996. In fact, the number of vehicles entering in 2010 increased by almost 18% over 2009, to now more than 2.44 million. Since the additional traffic reflects the impact of only 500 constructed of the 1,700 approved Woodstone Meadows timeshare units and none of the 300 approved Massanutten Station housing units, the annual trend of increasing traffic is expected to continue well into the future. In fact, the vehicle traffic in the first half of 2011 is already up 20% over 2009. Massanutten Drive, privately owned and maintained, is now the fourth most heavily traveled road in Rockingham County (behind Routes 81, 33, and 42), with an average daily traffic of over 15,300 vehicles. The combination of historical factors has created many challenges for the Massanutten Community. Currently, it lacks sufficient ways and means to balance the burden of paying for essential services among its property owners, citizens, businesses, and visitors. It is also not eligible to receive intergovernmental assistance to help pay for essential services which are stressed by a very large number of visitors from the general public. And, it lacks the ability to comprehensively plan and zone in the best interest of its citizens, to include their quality of life. Town incorporation of the Massanutten Community is one way to address these issues. However, property owners in the Massanutten Village district do benefit from being a private-gated district, where access by visitors from the general public can be somewhat limited and where privacy can be considered in governance. Town incorporation could have a negative impact on these benefits.